Ann Fagan Ginger speaks; Burton White holds microphone. "Among university employees participating in the demonstrations is Ann Fagan Ginger Wood. She is a part time worker in law research, and is the wife of James Fenton Wood, guitar strumming member of the Communist Party, according to sworn testimony before the House Committee on Un-American Activities. Mrs. Wood was photographed atop the stalled police car during the initial disorder advising demonstrators of their legal rights." It is the practice of the Internal Security Subcommittee to confine to executive session testimony involving likelihood of an adverse comment or report upon a named individual. Thereafter opportunity is extended to the individual to determine for himself if the testimony is adverse and to make response if he so desires, before the Committee considers whether that testimony should be made public. 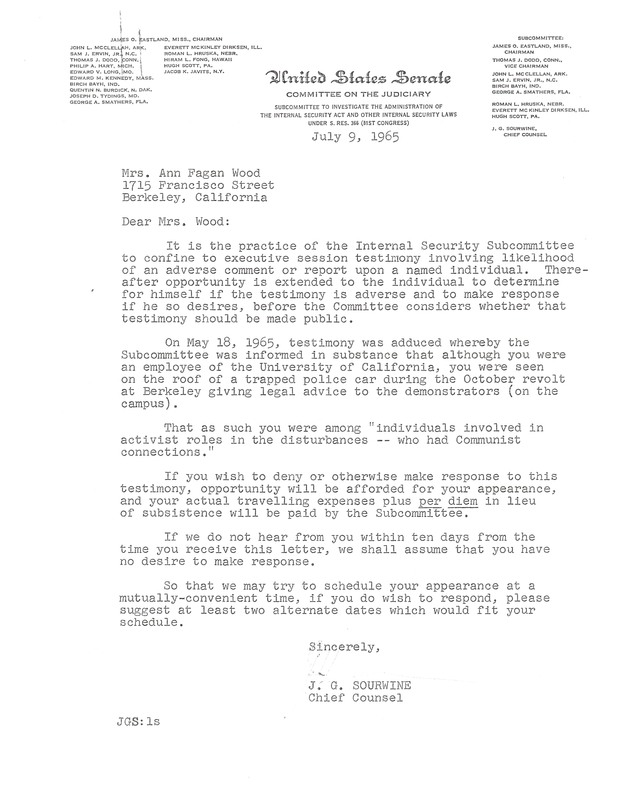 On May 18, 1965, testimony was adduced whereby the Subcommittee was informed in substance that although you were an employee of the University of California, you were seen on the roof of a trapped police car during the October revolt at Berkeley giving legal advice to the demonstrators (on the campus). If you wish to deny or otherwise make response to this testimony, opportunity will be afforded for your appearance, and your actual travelling expenses plus per diem in lieu of subsistence will be paid by the Subcommittee. If we do not hear from you within ten days from the time you receive this letter, we shall assume that you have no desire to make response. So that we may try to schedule your appearance at a mutually-convenient time, if you do wish to respond, please suggest at least two alternate dates which would fit your schedule. I would like to make a presentation on your point 1: Impact FSM had on my life at that time. I am an attorney now retired and founder of the Meiklejohn Civil Liberties Institute in 1965, a center for human rights and peace law and the author of 14 books on human rights and peace law. In October 1964, I was an editor for Continuing Education of the Bar of U.C. Berkeley and the State Bar. This was Friday afternoon and I was walking down Bancroft Way while Mario Savio was speaking from the top of a police car holding an FSM student and rallies had been held for several days. I saw many police cars on the Bancroft Way. I walked across Sproul Plaza and told Mario, whom I knew, that as a lawyer, I could advise him that everyone had a right to freedom of speech and freedom of assembly under U.S. and California Constitutions and the UN Charter, Article 55 and that the students should be told this. Mario asked me to say this to everyone. So I climbed on top of the police car and said that as a lawyer, I advise you that everyone has the rights to freedom of speech and freedom of assembly under US and California constitutions and the UN Charter Article 55. Then I climbed down from the car and started walking away. Before I had gotten very far, a reporter came up to me from the San Francisco Chronicle and asked me my name. I said, "I'm a lawyer. What I said is the law, you don't need my name." A few days later, the San Francisco Chronicle reported what I had said, then said "I was Ann Fagan Ginger, the wife of guitar strumming communist folksinger James F. Wood." In 1970, Continuing Education of the Bar got a new director who fired me immediately. I learned then that after my statement to the FSM, the FBI had gone to my supervisor at Continuing Education of the Bar every six months to urge that I be fired. And when the new supervisor took office, he fired me. This is the story I would like to tell at the FSM 50th Anniversary Reunion because it tells what effect supporting the rights of the students had on people who were not students, but were related to the University.